This article outlines the difficulties that people with severe and profound intellectual and multiple disabilities may have when swallowing. 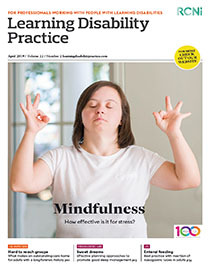 The article explains the prevalence, causes and nature of swallowing difficulties for people with intellectual disabilities and discusses the assessment of swallowing, eating and drinking problems. It also examines management of swallowing problems in this cohort, and uses a case study to consider how to support someone with such difficulties in the context of Orem's self-care deficit theory. The article concludes with broad recommendations for care.